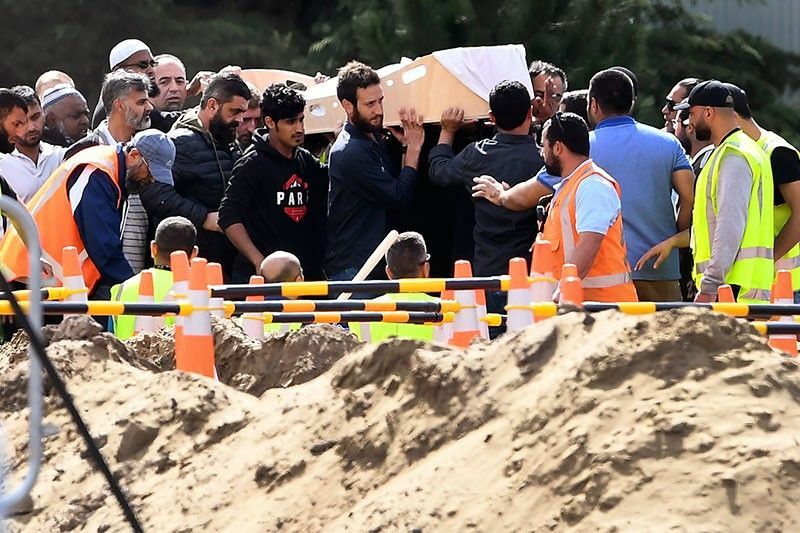 Mourners carry the first coffins of victims killed in the March 15 twin mosque massacre during a funeral at the Memorial Park cemetery in Christchurch on March 20, 2019. Hundreds of mourners gathered in a Christchurch cemetery on March 20 for the first funerals of those killed in the twin mosque massacre as New Zealanders braced for days of emotional farewells following the mass slayings. MANILA, Philippines — President Rodrigo Duterte has sent New Zealand, which is reeling from mass shootings in Christchurch mosques last week, condolences in a letter to its prime minister. In a letter to New Zealand Prime Minister Jacinda Ardern, Duterte said the Philippines stands with New Zealand and "joins all peace-loving in condemning this violent incident and those who seek to sow terror and fear among our people. The president added: "Our thoughts and prayers are with the families and loved ones of those whose lives were abruptly ended and those who continue to suffer from the assault." The Department of Foreign Affairs released a copy of the letter online on Friday. READ: President Rodrigo Duterte's letter to New Zealand Prime Minister Jacinda Ardern, following last week's mass shootings in Christchurch. Attacks at two mosques in Christchurch, the largest city on New Zealand's South Island, on March 15 left 50 dead and has prompted Ardern to announce an immediate ban on the sale of assault and semi-automatic rifles to prevent a similar incident in the future. Ardern has vowed that the Australian white supremacist behind the attack "will face the full force of the law in New Zealand." The Palace last week issued a statement condemning the attack and expressing solidarity with New Zealand. "The government and the people of the Philippines stand with New Zealand during this time of grief and outrage," presidential spokesman Salvador Panelo said then.